We are huge fans of the chocolate and orange combination around here, so we are going to be trying out these chocolate and sea salt mandarin oranges ASAP. Such an easy idea and I can imagine they are pretty darn delicious! The color makes them a perfect candidate for a Halloween snack. You could even call them something clever like jack-o-lantern smiles or something. Or you could just eat them. 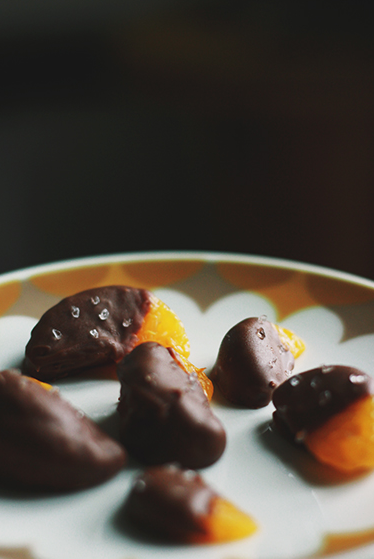 You can get the details for these yummy chocolate dipped orange treats over at Merry Thought. this looks so yum and perfect Halloween desert!